Alicyclobacillus acidocaldarius (Darland and Brock 1971) is the type species of the larger of the two genera in the bacillal family ‘Alicyclobacillaceae’. A. acidocaldarius is a free-living and non-pathogenic organism, but may also be associated with food and fruit spoilage. Due to its acidophilic nature, several enzymes from this species have since long been subjected to detailed molecular and biochemical studies. Here we describe the features of this organism, together with the complete genome sequence and annotation. 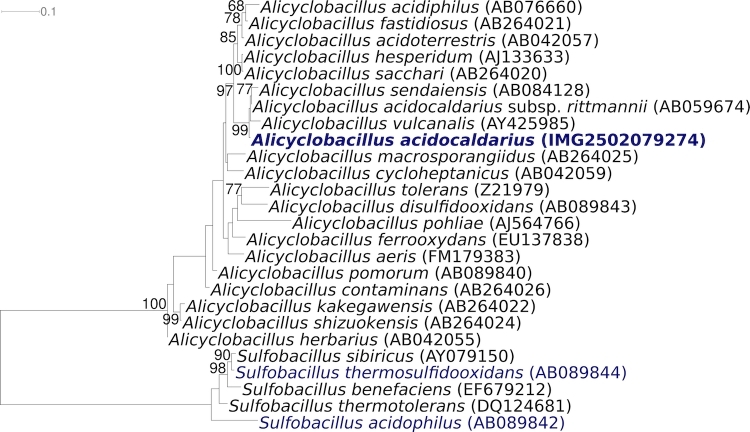 This is the first completed genome sequence of the family ‘Alicyclobacillaceae’. 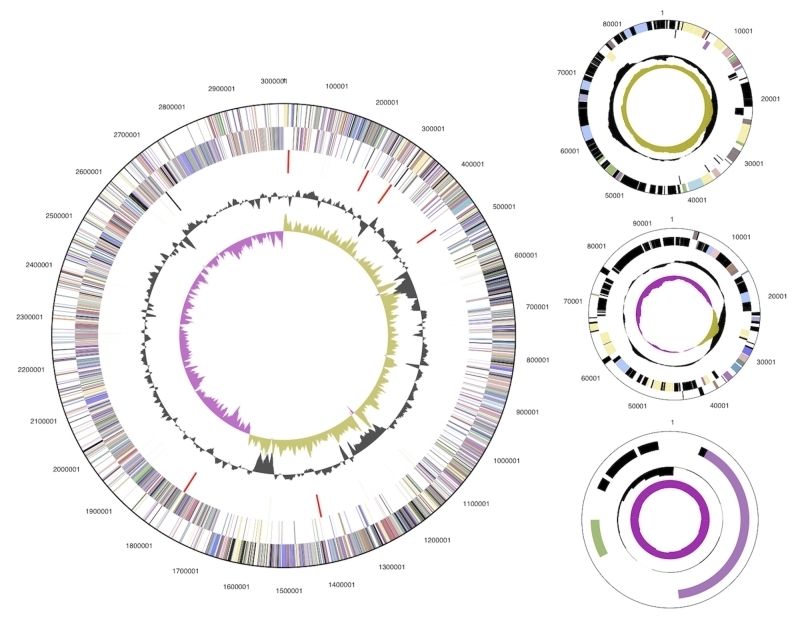 The 3,205,686 bp long genome (chromosome and three plasmids) with its 3,153 protein-coding and 82 RNA genes is part of the Genomic Encyclopedia of Bacteria and Archaea project. Strain 104-IAT (= DSM 446 = ATCC 27009 = JCM 5260 = NCIMB 11725) is the type strain of the species Alicyclobacillus acidocaldarius, which is the type species of the genus Alicyclobacillus . The genus currently consists of 20 species and two subspecies. Strain 104-IAT was originally isolated as ‘Bacillus acidocaldarius’ in 1971 (or earlier) from a hot and acidic spring in Yellowstone National Park, USA. In 1992, it was reclassified on the basis of comparative 16S rRNA gene sequence analysis into the new genus Alicyclobacillus . With the description of A. acidocaldarius subsp. rittmannii in 2002  the subspecies name A. acidocaldarius subsp. acidocaldarius was automatically created following rule 46 of the bacteriological code , with 104-IAT as its type strain. (hereinafter nevertheless referred to as A. acidocaldarius, without subspecies epithet). The species name derives from ‘acidus’ from Latin meaning acidic combined with ‘caldarius’, Latin for ‘belonging to the hot’. Due to its thermoacidic nature, this species serves as a model organism for molecular and biochemical studies of its enzymes [4-19]. Strain 104-IAT has also been used to produce the restriction enzyme BacI . Here we present a summary classification and a set of features for A. acidocaldarius 104-IAT, together with the description of the complete genomic sequencing and annotation. The type strain 104-IAT and several other strains were isolated from acidic hot springs in the Yellowstone National Park, USA, from soil from an acid fumarole in the Hawaiian Volcano National Park , and also from acidic environments in Japan . Other strains, as identified by 16S rRNA gene sequences and by metabolic traits, were isolated from orchard soil, mango juice, vinegar flies or pre-pasteurized pear puree in South Africa [23-25]. These findings are supported by the experimentally determined heat resistance of A. acidocaldarius strains in water, acidic buffer and orange juice . 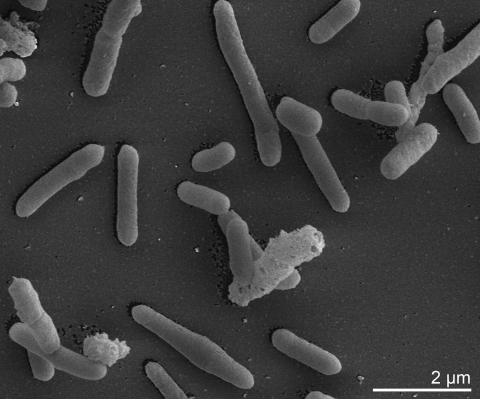 Thus, A. acidocaldarius might be involved in food and fruit spoilage, which is a characteristic of several other species of the genus Alicyclobacillus [23-25,27]. Clones with high sequence similarity (99%, AB042056) with the 16S rRNA gene sequence of strain 104-IAT are reported by the NCBI BLAST server from a ‘simulated low level waste site’ in USA (GQ263212), but not with any metagenomic environmental samples (October 2009). Figure 1 shows the phylogenetic neighborhood of for A. acidocaldarius 104-IAT in a 16S rRNA based tree. The sequences of the six 16S rRNA gene copies in the genome of A. acidocaldarius 104-IAT, differ from each other by up to six nucleotides, and differ by up to five nucleotides from the previously published 16S rRNA sequence derived from DSM 446 (AJ496806). Phylogenetic tree highlighting the position of A. acidocaldarius 104-IAT relative to the other type strains within the family. The tree was inferred from 1,419 aligned characters [28,29] of the 16S rRNA gene sequence under the maximum likelihood criterion  and rooted with the genus Sulfobacillus. The branches are scaled in terms of the expected number of substitutions per site. Numbers above branches are support values from 1,000 bootstrap replicates if larger than 60%. Lineages with type strain genome sequencing projects registered in GOLD  are shown in blue, published genomes in bold. On B. acidocaldarius medium (BAM medium)  strain 104-IAT forms round, slightly mucous, creamy-white colonies after 72 hours of growth with a diameter of 1-4 mm and rod shaped cells that were 2.0-4.5 μm long and 0.5-1.0 μm wide (Table 1 and Figure 2) . The endospores are terminal or subterminal and the sporangia are not swollen . The upper and lower pH growth limits are pH 2 and pH 6 . Strain 104-IAT grows on basal medium supplemented with glucose, galactose, casamino acids, starch, glycerol, sucrose, gluconate, inositol, ribose, rhamnose, and lactose, but not with ethanol, sorbitol, sodium acetate, succinic acid, and sodium citrate . Strain 104-IAT hydrolyses gelatin and starch but is oxidase negative and does not reduce nitrate to nitrite . Strain 104-IAT produces acid from glycerol, L-arabinose, D-xylose, D-galactose, rhamnose, mannitol, methyl-α-D-glucoside, arbutin, aesculin, salicin, cellobiose, maltose, lactose, melibiose, sucrose, trehalose, D-raffinose, starch, and glycogen, but it does not produce acid from erythritol, D-arabinose, L-xylose, L-sorbose, inositol, sorbitol, methyl-α-D-mannisode, amygdalin, melezitose, xylitol, β-gentibiose, D-turanose, D-lyxose, D-tagatose, D-fucose, and 5-ketogluconate . These acid production characteristics are largely congruent with the results from , however, L-sorbose, salicin, D-raffinose, starch, and D-turanose deviate across the studies [22,43]. Evidence codes - IDA: Inferred from Direct Assay (first time in publication); TAS: Traceable Author Statement (i.e., a direct report exists in the literature); NAS: Non-traceable Author Statement (i.e., not directly observed for the living, isolated sample, but based on a generally accepted property for the species, or anecdotal evidence). These evidence codes are from of the Gene Ontology project . If the evidence code is IDA, then the property was directly observed for a living isolate by one of the authors or an expert mentioned in the acknowledgements. Motility has not been reported for strain 104-IAT, although closely related species from the genus Alicyclobacillus are motile [22,27,43-45], which suggests a recent loss of motility in A. acidocaldarius. Indeed, strain 104-IAT appears to have all genes necessary for a flagellum. However, essential genes for type 3 secretion system chaperones (flgN, fliJ, fliT) and for flagellar gene expression (flhC, flhD) are missing in the genome, which finally explains the non-motile phenotype. Characteristic for several Alicyclobacillus species is the presence of a large amount of ω-alicyclic fatty acids [1,46]. As such, strain 104-IAT has approximately 51 ω-cyclohexane C17:0 and 33% ω-cyclohexane C19:0. Other fatty acids such as C16:0, C18:0, iso-C15:0, iso-C16:0, iso-C18:0, anteiso-C15:0, and anteiso-C17:0 amount at individual levels of approximately 1% to 5% [22,43]. Fatty acid composition is rather stable though not static across different temperature and pH values . Moreover, strain 104-IAT produces hopanoids, a group of pentacyclic triterpenoids, which together with the fatty acids constitute the lipophilic core of the cytoplasmic membrane. The amount of hopanoids depends on the temperature more so than the pH value . The main isoprenoid quinone is menaquinone with seven isoprene units (MK-7) . A. acidocaldarius 104-IAT, DSM 446, was grown in DSM Medium 402  at 60°C. DNA was isolated from 0.5-1 g of cell paste using Qiagen Genomic 500 DNA Kit (Qiagen, Hilden, Germany) with cell lysis modification st/L  and one hour incubation at 37°C. Genes were identified using Prodigal  as part of the Oak Ridge National Laboratory genome annotation pipeline, followed by a round of manual curation using the JGI GenePRIMP pipeline . The predicted CDSs were translated and used to search the National Center for Biotechnology Information (NCBI) nonredundant database, UniProt, TIGRFam, Pfam, PRIAM, KEGG, COG, and InterPro databases. Additional gene prediction analysis and manual functional annotation were performed within the Integrated Microbial Genomes Expert Review (IMG-ER) platform . The genome consists of a 3,018,755 bp long chromosome and three plasmids of 91,726 bp, 87,298 bp, and 7,907 bp (Table 3 and Figure 3). Of the 3,235 genes predicted, 3,153 were protein-coding genes, and 82 RNAs; 69 pseudogenes were also identified. The majority of the protein-coding genes (68.4%) were assigned with a putative function while those remaining were annotated as hypothetical proteins. The distribution of genes into COGs functional categories is presented in Table 4. Graphical circular map of the chromosome and plasmids. From outside to the center: Genes on forward strand (color by COG categories), Genes on reverse strand (color by COG categories), RNA genes (tRNAs green, rRNAs red, other RNAs black), GC content, GC skew. We would like to gratefully acknowledge the help of Susanne Schneider (DSMZ) for DNA extraction and quality analysis. This work was performed under the auspices of the US Department of Energy's Office of Science, Biological and Environmental Research Program, and by the University of California, Lawrence Berkeley National Laboratory under contract No. DE-AC02-05CH11231, Lawrence Livermore National Laboratory under Contract No. DE-AC52-07NA27344, and Los Alamos National Laboratory under contract No. DE-AC02-06NA25396, as well as German Research Foundation (DFG) INST 599/1-1 and SI 1352/1-2. Prévot AR. In: Magrou J, Prévot AR, Rosset G (1953) Dictionnaire des Bactéries Pathogènes. 1-692. Ludwig W, Schleifer KH, Whitman WB. Revised road map to the phylum Firmicutes In: De Vos P, Garrity G, Jones D, Krieg NR, Ludwig W, Rainey FA, Schleifer KH, Whitman WB (eds), Bergey's Manual of Systematic Bacteriology, Second Edition, Volume 3, Springer-Verlag, New York, 2009, p. 1-12.